I refuse to shop at businesses that misuse the apostrophe in their primary signage. Picture via Apostrophe Abuse, a blog dedicated to combating this widespread grammatical perversion. Maybe there is only one kid there. 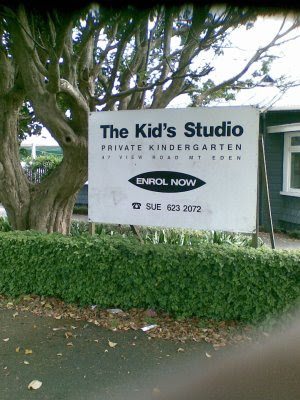 Well, maybe The Kid runs this studio -a private kindergarten run by The Kid. Maybe it's named after Cheung Po the Kid, a pirate from the 1800's. Maybe it's dedicated to increasing the number of pirates in an effort to decrease global warming. Such a worthy goal! Because surely in these competitive days of economic hardship, an educational institution would at least get the spelling checked before paying for a sign. I worked for eight years on a job where, in the locker room, there was a bumper sticker that read "Are We Having Fun Yet!" Oh, yea, and why that specific, less used spelling of enroll? Is it a Floridian thing? Your absolutely right about this. I cant stand it when people misuse they're apostraphe's!